What is concrete poetry? Concrete poems are objects composed of words, letters, colors, and typefaces, in which graphic space plays a central role in both design and meaning. Concrete poets experimented boldly with language, incorporating visual, verbal, kinetic, and sonic elements. 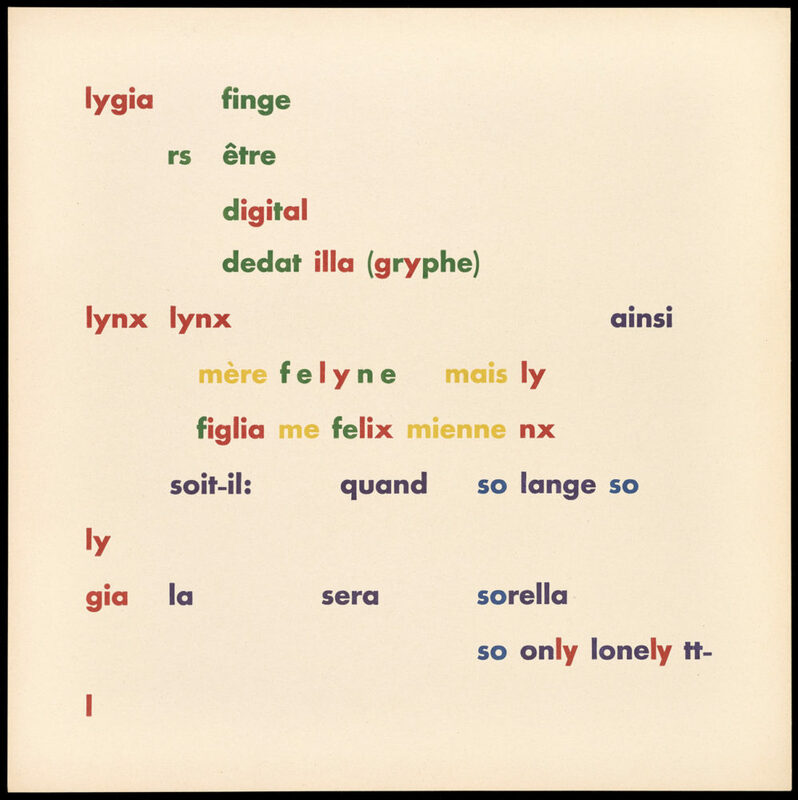 While it is important to note that there is no single definition of concrete poetry, the concrete poems that emerged from the international movement that began in the 1950s in Europe and South America do share important defining characteristics. These are highlighted in Concrete Poetry: Words and Sounds in Graphic Space, a new exhibition at the Getty Research Institute (March 28–July 30, 2017). 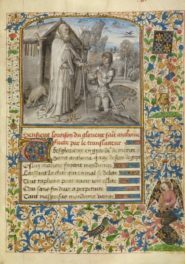 Through more than 100 works including prints, artists’ books, and journals—drawn primarily from the Getty Research Institute’s collections—the exhibition presents the innovative poems of the Scottish poet Ian Hamilton Finlay and the Brazilian poet Augusto de Campos, as well as those by European and American contemporaries. Created in the 1950s, ’60s, and ’70s, the works still resonate in our own era of streamlined communication, in which messages can be conveyed via texts using single words, acronyms, and even emoji. The artists represented in the exhibition each developed his or her own unique approach to concrete poetry, and in some cases, these approaches evolved over time. The diversity of their works is highlighted in exhibition sections focusing on wordplay, the role of sound, three-dimensionality, and shifting media. Concrete poets were masters of subtlety and reduced language, creating poems from very few words (or sometimes, a single word), which they then manipulated, permutated, and transformed. 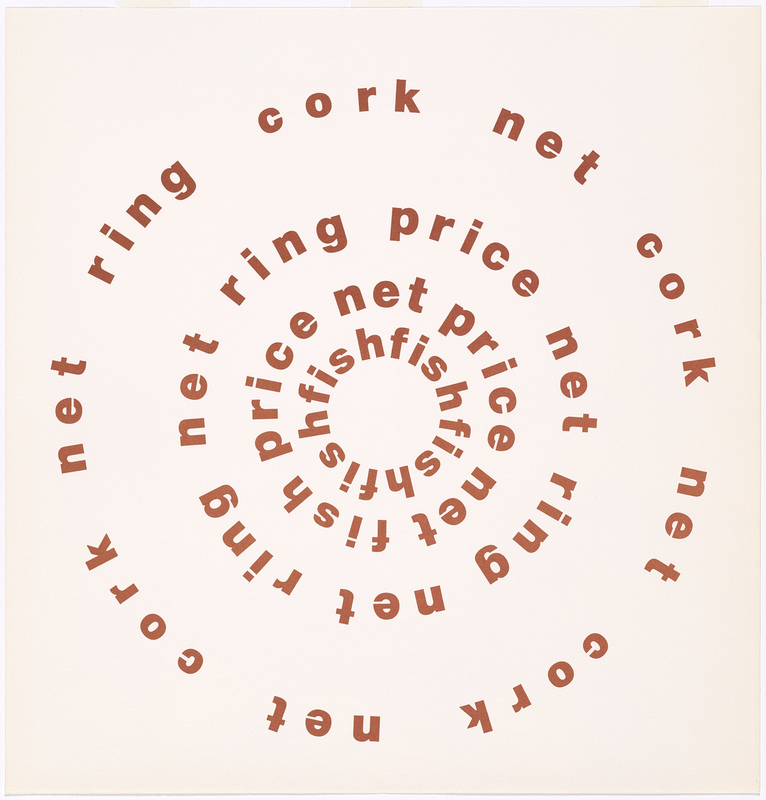 In Ian Hamilton Finlay’s Cork/Net, four concentric circles are composed of only five words: cork, net, ring, price, fish, forming the shape of a net cork (a type of float used in fishing). The poems in this section of the exhibition challenge our linear methods of reading. In Cork/Net, where does one begin? Where does one end? O Pulsar (The Pulsar), 1975, Augusto de Campos. From Poesia concreta in Brasile (Milan: Archivio della Grazia di Nuova Scrittura, 1991). 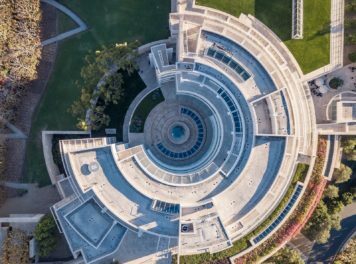 The Getty Research Institute, 45-13. Courtesy Augusto de Campos. The crucial role of sound in concrete poetry can best be appreciated by pairing visual poems with audio recordings by native speakers of the language in which a poem was written. Visitors to the exhibition will hear poems by Augusto and Haroldo de Campos (Brazilian Portuguese), Ian Hamilton Finlay (English with a Scottish accent), Henri Chopin (French), and Ernst Jandl (German). 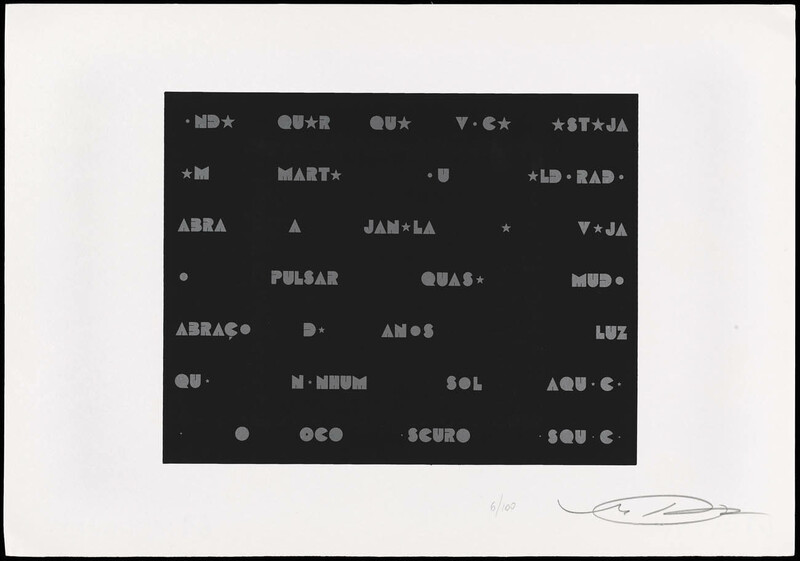 Concrete poems—referred to by the Brazilian Noigandres poets as verbivocovisual—were intended to be multi-sensory experiences. In Augusto de Campos’s O Pulsar, stars and circles replace the letters e and o respectively, and these same vowel sounds are sonically emphasized in the accompanying recording, which features the Brazilian composer, singer, and writer Caetano Veloso. Along with the Spanish artist Julio Plaza, Augusto de Campos created and published a set of pop-up object-poems called Poemobiles. 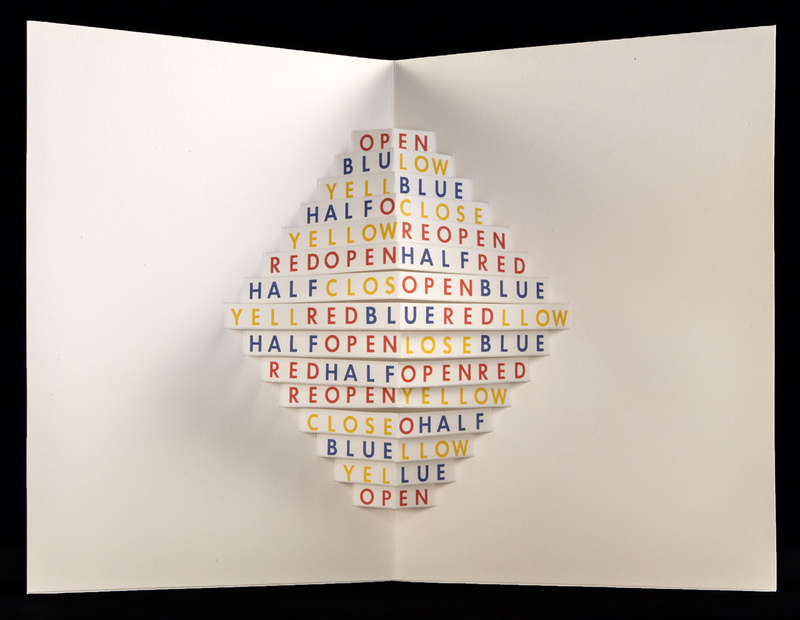 Open, first produced in 1969, consists of the words open, reopen, close, and half, along with blue, yellow, and red. A companion Portuguese version entitled Abre also belongs to the series. The 20 three-dimensional poems in this section of the exhibition are meant to be opened and closed, rearranged to reveal or obscure language, and even to be viewed in the round. 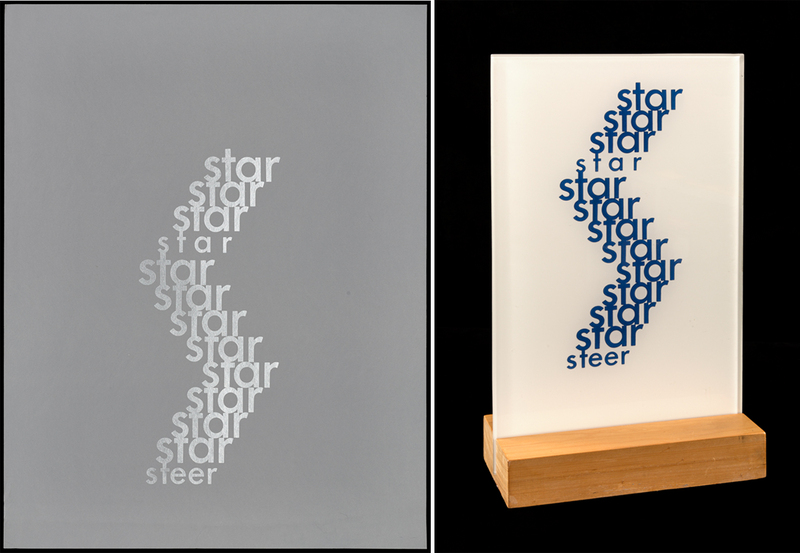 Star/Steer exists both as a poster poem and as a glass sculpture. These two works by Ian Hamilton Finlay illustrate his remarkable ability to reinvent poetry across media. 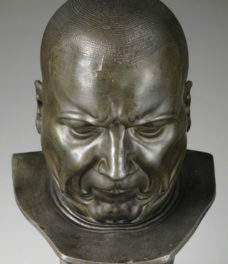 Augusto de Campos likewise issued his poetic works in multiple versions. Works from Caixa Preta (Black Box), a collaborative portfolio produced with Julio Plaza, appear in several formats in the exhibition. Notably, Augusto continues to experiment with his earlier poetry, transforming it into dynamic, digital animations, three of which are projected in Concrete Poetry: Words and Sounds in Graphic Space. Learn more about the commonalities and differences among artists in the international concrete poetry movement at “‘Paper Pear Paper’: Charting the Course of Concrete Poetry,” a panel discussion at the Getty Center on Thursday, April 6, 2017 at 7 pm. This is a free event; RSVP required.